In this article, we will show how to make the most of your Panda Account. From your account, you will be able to download your product, send queries to Support, check your order and a lot more. Please, click on the + sign to display the information of each section. + What is your Panda Account? - What is your Panda Account? The download of your product. The management of your product services, such as the license expiry date, renewal of your subscription, etc.. The download of your specific product. The sending of queries of your product to Technical Support. Access your Panda Account to manage every question related to your product. If you haven't created your Panda Account before, register, fill in the required fields and select Create. Access your inbox, open the email sent by Panda Security and click Activate your Panda Account! From your Panda Account, click Your Products and download the version for Windows, Android or Mac by clicking the box called Download. If you don't see your product, add the Activation Code by clicking the I have a code button. Check and modify your personal data. From your Panda Account, go to Details of invoice, See my invoices. From the menu, access the Settings section. Go to the General menu, Panda News. Move the switch to the OFF position to stop getting notifications or pop-ups related to your product. If you wish to stop receiving notifications related to offers and commercial promotions of your product or service, access the web form and send us your request. The GDPR (General Data Protection Regulation) implies a change in how personal data is managed by organizations. If you want Panda Security to, either partially or totally, cancel the treatment of your personal data, please go to the web form from your Panda Account and enter your request. 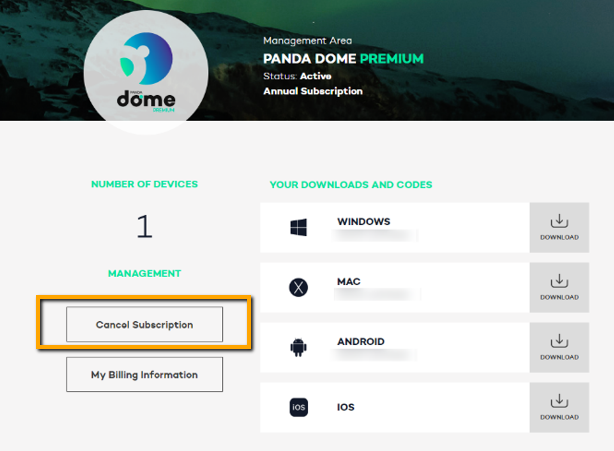 From your Panda Account, in Your products, select the product subscription you wish to cancel and click the option located on the left panel called Cancel subscription. You will receive an email confirming the cancellation of services. Keep in mind that a cancellation cancels future renewal charges, but does not result in a refund of your order. Your product will remain active and your devices protected during the period of time you were subscribed to (1 month, 1 year, ...). Once this period is over, if you do not renew manually, your protection will expire and you will be unprotected against malware. If you want, you can manage the automatic renewal of your product (only valid for online purchases). Panda Security is committed to refund any online purchase within 30 days after the purchase. To request it, access the web form, fill in the fields (Select Customer Service in the Problem field) and send it. If you have any query related to your Panda Account or with the way your product works, access Support, Contact, fill in your data and send us your query. We will answer as soon as possible!